One great benefit of VPS hosting is being able to easily host multiple websites off the same server. Owning a VPS offers much more than just web hosting but in this tutorial we will show you how to setup virtual hosts with Apache. Apache HTTP Server is probably one of the most influential pieces of open-source software that let to the explosive growth of the World Wide Web today. Still going strong it is the leading web server used across the internet today. Apache HTTP Server runs on many operating systems such as Unix, Linux, BSD, Windows, OSX, and Solaris, among others. 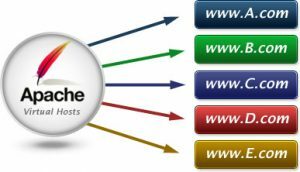 Apache HTTP Server is developed by the Apache Software Foundation, and has a strong community of developers supporting the project. Setting up v-hosts is straightforward. In your HTTP Configuration file add the following lines. Modify the settings for your environment. If you have any question leave a comment and we will get back to you. # This is the server running on your main IP.